What Fruits And Veggies Can Horses Eat? 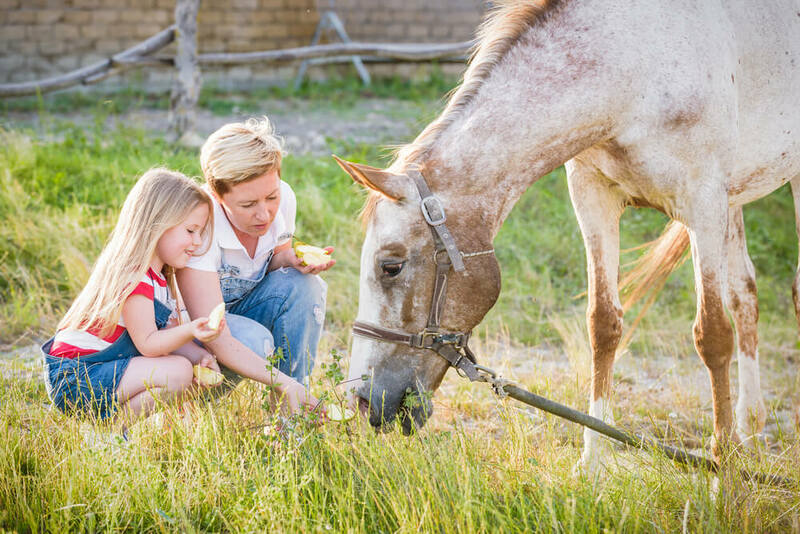 If you’re going to feed your horses treats, natural fruits and vegetables are the best treats to give. Even so, it’s not smart to overfeed treats. 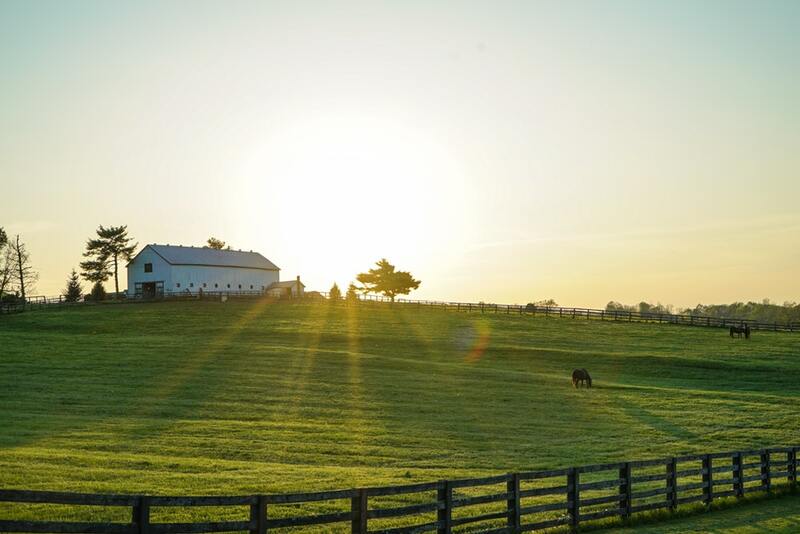 Remember that horses have very delicate digestive systems and anything excessive or unusual can lead to serious problems such as colic and laminitis. In this article, we discuss the types of fruits and vegetables that are safe to feed your horse. We also provide good information and advice on how and when to give your horse fruit and veggie treats. Read on to learn more. 1 What Are The Best Fruits and Veggies For Horses? 1.1 What About Exotic Fruits Such As Bananas And Oranges? 2 What Are The Worst Fruits And Veggies For Horses? 2.1 Can A Horse Eat Fruit That’s Gone Bad? 3 How Do You Prepare Fruits And Veggies For Your Horse? 3.1 Should You Peel The Fruits And Veggies? 4 What’s The Best Way To Give Your Horse Fresh Fruit And Veggie Treats? 4.1 Should You Hand Feed Your Horse? What Are The Best Fruits and Veggies For Horses? Vine fruits, such as watermelon, cantaloupe and other melons are safe to feed to horses. Many people give their horses, donkeys and mules the rinds of watermelons and other melons. Squash such as zucchini, yellow squash and pumpkins are also good treats for horses. Some root vegetables are also safe for horses to consume. 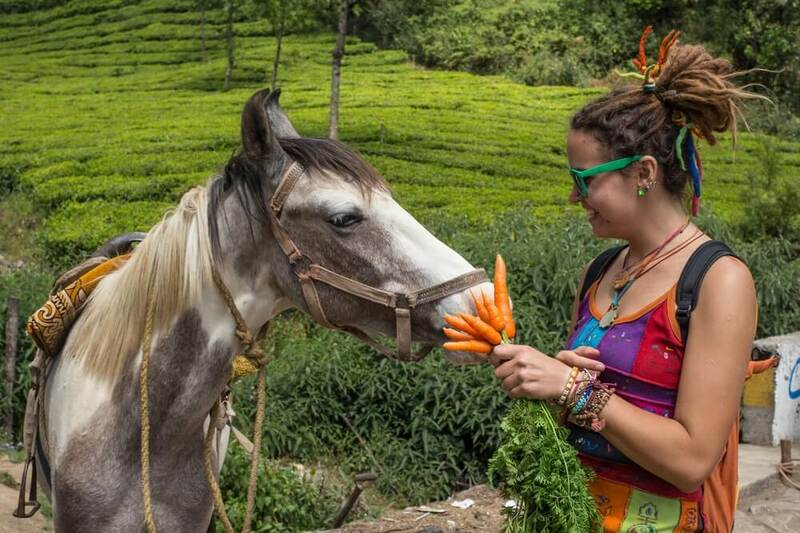 Carrots are the classic horse treat, and in limited amounts they can be very good for horses. Your horse can safely eat one or two carrots every day. What About Exotic Fruits Such As Bananas And Oranges? Some horses like unusual fruits, and you can certainly check and see if your horse is one of them. Horses that do like bananas can eat the whole fruit, skin and all! Be sure to take the sticker off! Some horses like to eat orange sections. If your horse is one of them, they certainly will not hurt him. Keep in mind that horses do not like orange skin any more than people do, so be sure to peel citrus fruit before offering it to your horse. Tropical fruits such as papaya and pineapple may also be favored by horses and are safe to feed in moderation. Your vet might even recommend papaya because it contains a digestive enzyme that may be helpful if your horse has ulcers or is colicky. What Are The Worst Fruits And Veggies For Horses? Root vegetables other than carrots tend not to be favored, and may not be safe. Even though some people believe that it’s all right to give a horse raw turnips, radishes and beets, most horses will turn their noses up at these. Whether or not these raw veggies are safe is a matter of debate as they tend to be a bit gassy. Vegetables that produce gas are not logically safe to feed to an animal that is prone to colic and does not have the ability to burp. For this reason, you should not feed your horse any cruciferous vegetables such as Brussels sprouts, cabbage, kale and the like. These are very gassy vegetables that your horse would be very unlikely to encounter in the wild and probably would not like. Better safe than sorry, just keep these veggies away from your horse. Poisonous vegetables should also be kept away from your horse. While members of the Hemlock family such as tomatoes and potatoes are not poisonous to us, they may very well be poisonous to horses. Don’t give your horse potatoes and tomatoes. While some horse owners do give their horses veggies such as rhubarb and celery, these two are unlikely to be favored by horses and may be dangerous. Rhubarb leaves are especially dangerous as they are toxic to both humans and horses. Horses simply don’t like vegetables such as onion and garlic, and these would tend to cause gastric upset. You want to avoid gastric upset because of the danger of colic. Additionally, onions and garlic and other Allium vegetables may cause horses to become anemic. Avocados are also dangerous for horses. In fact, the skin is poisonous for all animals including people. Don’t give your horse any avocados. Can A Horse Eat Fruit That’s Gone Bad? This really depends on your definition of “bad”. It will not hurt your horse at all to eat fruit that is merely bruised or a little overripe. Don’t ever feed your horse anything that is rotten or moldy. Mold is extremely dangerous for horses and even a small amount can cause colic and laminitis. How Do You Prepare Fruits And Veggies For Your Horse? The best way to add fresh fruits and veggies to your horse’s diet is to wash the produce thoroughly and cut it up into bite-size pieces. These can be about the size of a grape. Even though horses can eat whole apples and whole carrots and other whole items of fruit, some tend to wolf them down. This can cause choking. It’s better to cut the fruit up to a manageable size and place it on top of your horse’s feed. Be sure to wash dirt and sand off fresh produce as these things are not edible and may cause sand colic. Remove pits from fruits such as peaches, cherries and other pitted fruit. Pits can be a choking hazard. Should You Peel The Fruits And Veggies? For horses, the peel is often the best part!! Horses like cantaloupe, watermelon and pumpkin rinds. They will eat banana peels, and they like carrot peels, zucchini and squash peelings. While some information tells you to cut the ends off of carrots, squash, zucchini and bananas and to throw out apple cores, this really isn’t necessary. Your horse will not have trouble eating these parts and will like them perfectly well. What’s The Best Way To Give Your Horse Fresh Fruit And Veggie Treats? One good way to add fruits and veggies to your horse’s diet is to keep a container in your fridge for apple cores, the ends and pieces and peelings of squash, zucchini, carrots and the like. Just add this to your horse’s feed daily, as long as it isn’t too much! Don’t give your horse more than the equivalent of one large item of produce per day. For example, large apple, two medium-size carrots a whole zucchini or the equivalent in fresh fruit and veggie scraps and rinds is plenty. Don’t place fruit and veggie treats directly on the ground as this may lead to ingestion of sand and dirt. This can cause sand colic. Tip: If you have an old horse who has trouble chewing, you can make him a smoothie! Just put the fruit in the blender and add it to his feed. This is especially easy if you have a horse that eats a mash of soaked beet pulp, grain and the like. Should You Hand Feed Your Horse? Even though it’s very tempting to feed your horse treats by hand, this is not a good habit to get into. Horses who take food from your hand may come to expect food from your hand. This can be a good way for you to get accidentally bitten if your horse thinks you may have food and you don’t. Likewise, if you are giving your horse a treat by hand and he accidentally bites down on your finger he will not be able to let go. Once a horse bites down he continues to bite down, and this is a good way to lose a finger. If you must feed your horse by hand, be sure to hold your hand perfectly flat with your fingers flexed back and your palm up. Place the item you are offering your horse on the center of your palm and hold your hand still until your horse has taken the item. Don’t curve your fingers up or jerk your hand away. Doing either of these things is a very good way to get bitten. Your horse will not try to bite you, but he will try to get the food. If your fingers are in the way, he is very likely to bite your fingers. If you pull your hand away he’s very likely to move forward and bite harder and may accidentally bite your hand.